With the rain coming down in buckets all around us, it feels more like a spring day in New England than a summer day in Mexico! 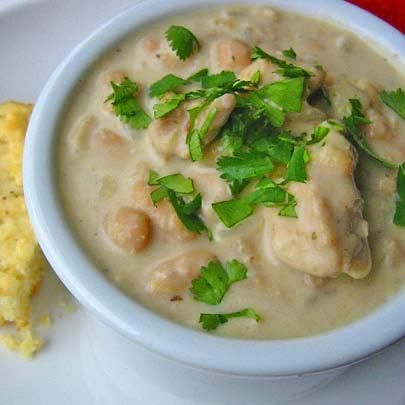 In our house, days like this call for something warm and comforting and a family favorite of ours is White Chicken Chili. This is another recipe that came out of our kitchen back in Mystic Connecticut. It is one of my childrens' very favorite foods, one that they request time and time again. Truth be told, it came off of the back of a McCormick's can and I adapted it over the course of a summer to suit our tastes. Now, before you scroll down and think "No way, that's way to many ingredients and way too much work!" take a breath and remember - If I can do it with Rob hovering over my shoulder, the dogs begging underfoot and two children getting into who knows what, then so can you. The key to making this chili easily is "mis en place". You must have all of your ingredients prepared, measured and ready to go before you turn on the burner. Over medium high heat cook onion and butter in a large stockpot until onion is soft. Add garlic, cook an additional 2 minutes. Lower heat, Add chili powder, cayenne, cumin, clove and flour. Cook, stirring for 5 min. Turn heat up and slowly add warm chicken broth, stirring. Bring to a boil and simmer 3 min. Add raw chicken cubes and cook thoroughly, about 7 min. Lower heat, Add green chilies, salt, beans and yogurt. Simmer 5 min. Remove from heat, cover, allow to rest 15 min. Add salt and pepper to taste. Serve it up!!! Yummy. Michele, what canned chiles do you use here? Rajas poblanos? I get the little cans of chilies picados, I think they are jalapenos. You can find them in the same place as all the other canned chilies rajas and nacho rings. Cut them up finer and drain them to keep some of the heat out! Provecho!